We are thrilled to partner with Seattle Rep to offer a daily lottery for $20 tickets to Here Lies Love, the critically-acclaimed immersive disco extravaganza that previously ran at The Public Theater and the Royal National Theatre in London. Read on for why you do NOT want to miss this one. At Here Lies Love you don’t just sit and watch. Audience members stand on the main floor of the Bagley Wright theatre which has been re-imagined as a dance club with bumpin’ beats. You are in the middle of all the action, dancing with the cast. Check out the rave from the Seattle Times to know more about what to expect. If audience interaction is not your thing, do not fear – patrons also have the option to sit in the gallery for a more low-key experience. The scenic design is a feat. 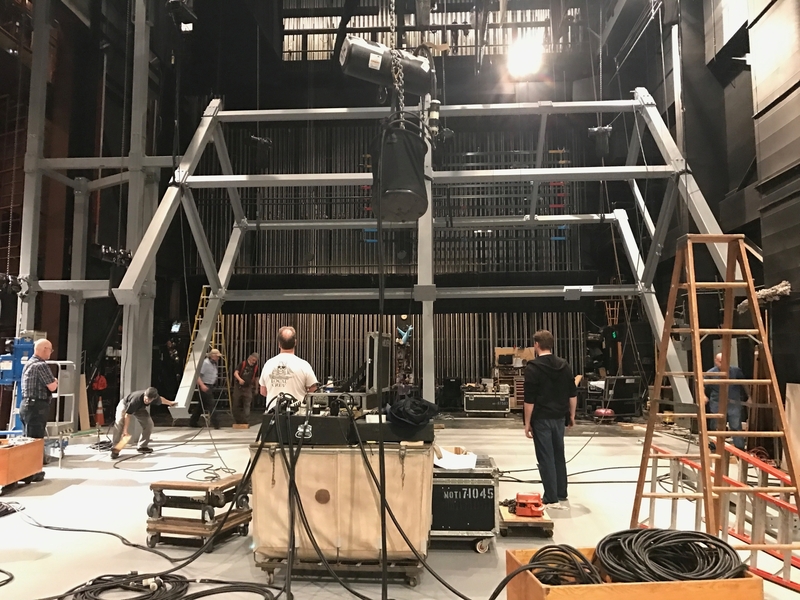 If you’re a regular Seattle Rep patron, Here Lies Love is worth checking out just to see how the team and crew has transformed the proscenium Bagley Wright Theatre into an “immersive, 360-degree spectacle” just for this show. The usually 850-seat venue is now an immersive discotheque for 250 patrons – read the Seattle Times feature for how they pulled it off. History nerd? You’ll love it. Here Lies Love is inspired by real people and events. It follows the life of Imelda Marcos, the wife of the Filipino president Ferdinand Marcos, and takes us through the People Power Revolution, a non-violent restoration of democracy that overthrew her husband’s dictator regime. You will get a vibrant imagined story of what might have been on the mind of power-hungry, glamorous Imelda. The drop dead gorgeous costumes. Imelda was a notorious fashion icon, obsessed with luxury brands and always dressing in extravagant outfits. Legend has it that she owned more than 2,000 pairs of shoes. 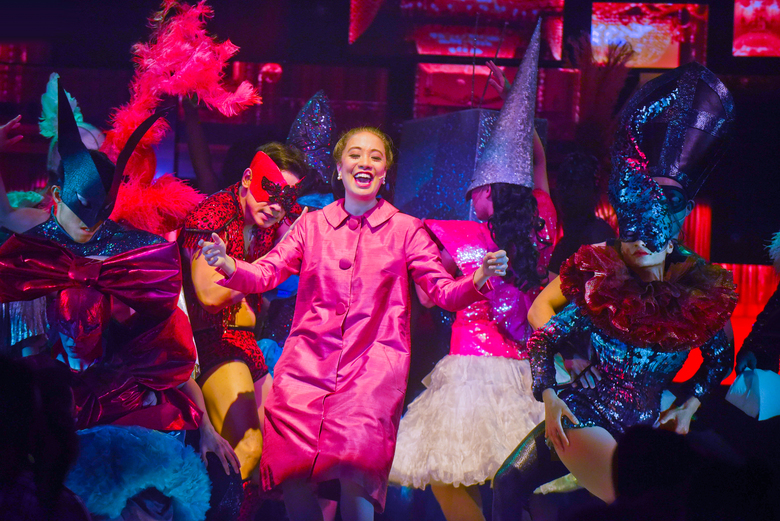 Makes sense that the colorful costumes of Here Lies Love (designed by Tony Award-winning designer Clint Ramos) are to die for. David Byrne isn’t just for your parents. You might be familiar with David Byrne, the writer of Here Lies Love, through his rock band The Talking Heads (which might be your parents’ favorite band.) 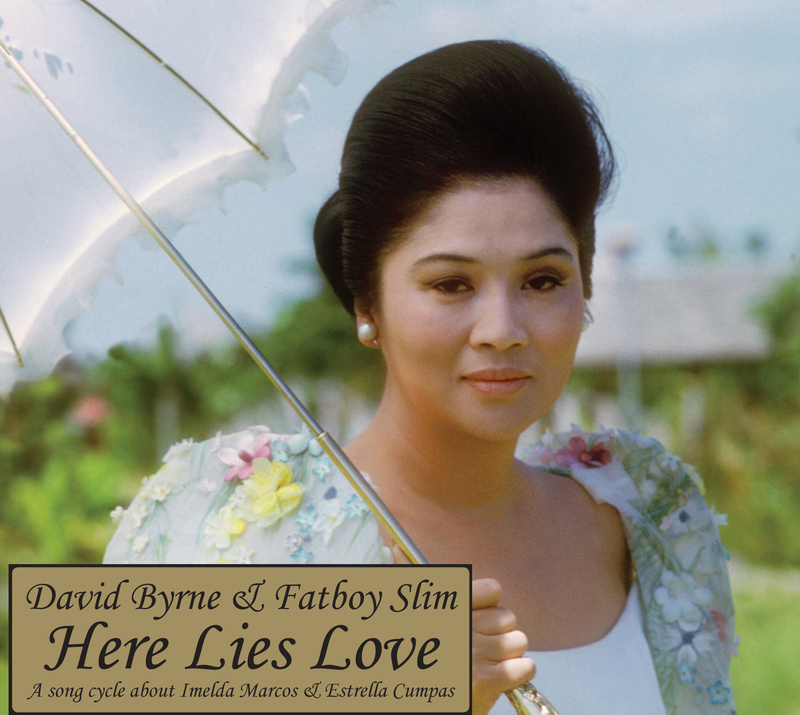 Byrne is a total musical chameleon – the score of Here Lies Love is pure disco and a collaboration with British DJ Fatboy Slim. It’s like Evita for 2017. Are you a huge fan of Evita, the classic musical by Andrew Lloyd Webber and Tim Rice? Or the movie adaptation starring Madonna as the powerful wife of Argentine president Juan Perón? If nothing else, surely you’ve heard of the iconic 11 o’clock number “Don’t Cry For Argentina.” Well, in 2017, if you are craving a high energy pop musical about a dictator’s superstar First Lady, Here Lies Love is your obvious answer. Two-time Tony-nominated director Alex Timbers is known for his innovative, spectacular staging. Bloody Bloody Andrew Jackson on Broadway, the downtown sensation Dance Dance Revolution and recently, Joan of Arc: Into the Fire at the Public. Next up, he is tapped to direct the stage version of beloved film Moulin Rouge! on Broadway – this is your chance to catch his work right in Seattle. Don’t miss the disco, put on your dancing shoes and enter the daily mobile lottery for a chance to win $20 tickets, exclusively on TodayTix!